I, Malvolio re-imagines Shakespeare’s Twelfth Night from the point of view of one of its minor characters, the most notoriously abused steward. It is one of a collective of four I, Shakespeareplays written by actor/playwright, Tim Crouch, with the purpose of bringing Shakespeare to a young audience. What inspired you to write I, Malvolio? I played Malvolio in a production of Twelfth Night in New York back in 2001. His is one of the great unfinished stories. His last line in Shakespeare’s play is: ‘I’ll be revenged on the whole pack of you.’ But then you never find out what his revenge might be. In my play I explore what it could be. He’s treated really badly in Twelfth Night and yet we all laugh at him. He’s a carrier for lots of themes – from cruelty to bigotry, from repression to release. He’s not in the play that much, but he’s the most memorable presence in it. He is both a tragic hero and a clown. I’m also interested in him because he’s someone who hates theatre and he’s stuck inside a play. This chimes with my theatrical obsessions – to have someone on stage who challenges the whole point and purpose of the audience’s presence. The show was written to introduce teens to Shakespeare. Can you explain why is it so important to you that young people continue to learn about the works of Shakespeare? Shakespeare informed our modern sense of what it is to be human. He ‘invented’ our idea of the human. Before him – and the European playwrights of the Renaissance – our actions were determined by God or by the gods. Shakespeare’s work still influences how we think about ourselves as human beings. This is why it’s necessary to keep him alive in our culture – and this means making him especially relevant to young people. Keeping young people away from Shakespeare is like removing a link to their humanness.Shakespeare’s plays do not belong in a museum. They speak to how we live today. 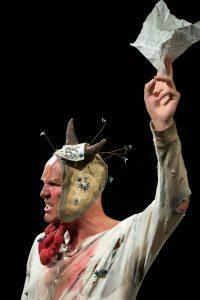 My intention with I, Malvolio is to honour Shakespeare but also to make his stories accessible. Shakespeare can be scary for a young person – for anyone! Some people think of him like a different language – even in the UK. My job is to release Shakespeare from the fear that exists around him. What should the audience expect from I, Malvolio? What they shouldn’t expect is a nice comfy snooze in a dark auditorium. This is theatre, not film. It’s theatre that is nothing without its audience. I,Malvolio is a solo show – but there are two characters in it: me and the audience. We play together – a game of theatre-goer and theatre-hater. Don’t worry – you won’t be picked on but you will be rudely implicated! And you will be subtly invited to misbehave. It’s a lovely playful space that invites the audience to be complicit in what’s going on. We make the show together. Describe the relationship between you as performer and your audience. I have written I, Malvolio in the hope that I will be constantly wrong-footed by the audience. I want the audience to misbehave, to arrive late, to keep their phones on, to scorn and trick me. The more the audience lose their discipline the more they find their inner Toby Belches. And the more they find their inner Toby Belches the more I can be Malvolio in opposition to them. There’s a moment in the show when I leave the audience to themselves – like a teacher leaving the classroom. It is my hope that in this moment the audience will stage a minor coup. This has happened to greater and lesser degrees in the life of the show. In China, recently, one audience member destroyed a rather key prop while I was off stage. This was a little more that I had anticipated, but the audience were all in on the individual’s act and it led to some strong interactions around collective blame and responsibility… My job is to deal with whatever is thrown at me. In that sense, the show is a bit like a stand-up act. It treads the same knife-edge. What would you like to ask Shakespeare if he was around today? How do you do it without a computer? How do you cut and paste with a quill? How do you keep it all in your mind? How many re-writes do you do? Who is your first reader? How long does it take? Do you structure before you start to write? Does it come easily or do you struggle? Do you surprise yourself? How focused are you on the language – or does story come first and language follows? Does writing in blank verse help you or hinder you? Does your creative genius torture you or satisfy you? Which play are you proudest of? Do you get frustrated by actors not doing it how you imagined it to be done? Are you happy with the published versions? etc .. etc..etc..